In a large bowl, stir together ginger, garlic, red pepper flakes, soy sauce, broth, and peanut butter. Stir in pork to coat. Set aside. Heat oil is wok or large skillet over medium-high heat. Add onions and cook ~1 minute. Add cashews. Cook until onions are soft and translucent. Add pork and marinade. Cook until pork is done ~10 minutes. Add vegetables. Cook ~5 minutes more. 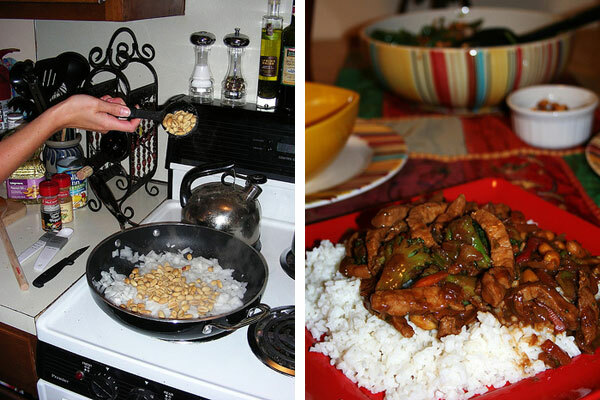 Pour pork stir fry over white rice and serve.